Home Runs aren't supposed to be hit in Triples Alley. 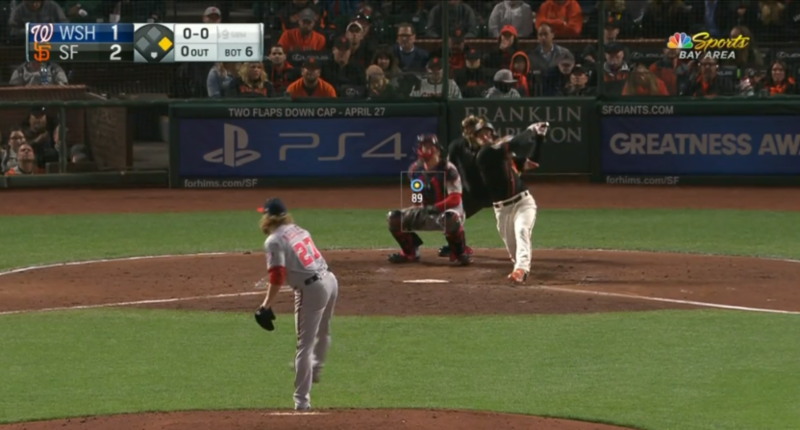 San Francisco Giants outfielder Mac Williamson didn’t have a friendly welcome for Washington Nationals reliever Shawn Kelley, on Kelley’s first pitch of Monday night’s game at AT&T Park. Williamson blasted a Kelley fastball 464 feet into right-center field, which actually doesn’t clear the wall by too much at this part of AT&T Park. This area of the field is known as “Triples Alley,” where doubles usually become triples, and should-be home runs usually fall short and result in triples. Mac Williamson crushed one a dozen rows deep into Triples Alley during a cold night game. He can stay. In the past four days, Mac Williamson has hit the hardest HR that Statcast has ever tracked from a Giants player, and now the 2nd-longest HR. That was a rocket to CF at AT&T.